Ciix is ? ?your reliable partner when it comes to creating banners and header design. Our offer includes the creation of individual and high-quality banners for your website. We include special attention to the needs of our customers and make a professional banner designer with years of experience and first-class yet affordable Banner specifically to your liking. 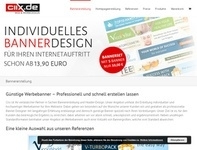 Software Shop.com.de is a renowned provider for Microsoft products. In addition to MS Office and Windows, we offer the Microsoft Visio and Microsoft Project programs at very attractive prices. You get 100% original software from Microsoft. The average shopping cart is 231 EUR. How you as an entrepreneur put your customer acquisition on autopilot in just 7 days without burning money. A profitable strategy that allows you to fully automate, gain new customers within a few days.